Looking for a great, affordable option for visiting Arizona State Parks? The annual day use pass allows access for up to four people to state parks across Arizona. Use your pass to continuously enjoy your favorite local state park or explore parks throughout the state. A day use pass opens the door to exploring every corner of amazing Arizona — perhaps experiencing a different location each weekend. History lovers can explore the stories of the past at the state historic museums. We offer a standard pass for weekday use at all parks, including weekends at many parks. The premium pass includes weekend and holiday access to the parks along the Colorado River (Buckskin Mountain, Cattail Cove, Lake Havasu and River Island), as well as Patagonia Lake and Slide Rock State Parks. Boyce Thompson Arboretum is not included in either annual park pass. Plus, with every purchase of an Arizona State Parks & Trails annual pass, visitors will receive a free year-long subscription to Arizona Highways magazine. You can purchase your park pass online and have it mailed to your home, or pick one up in our parks (except Boyce Thompson Arboretum and Colorado River, McFarland, Riordan Mansion, Tubac Presidio, and Yuma Territorial Prison state historic parks). Order by phone Monday - Friday between 8 a.m. - 5 p.m. MST at 877-MY-PARKS (877-697-2757). Surprise friends and family with the gift of adventure! Gift cards are a great way to share the beauty of Arizona's open spaces for those "hard to shop for" types that love the outdoors. Use cards for state park day-use, overnight camping, cave tours or park store purchases at state parks across the state. Cards may be purchased below using our secure online portal or at select state park offices across the state. Online options include $25, $50 and $100 denominations. 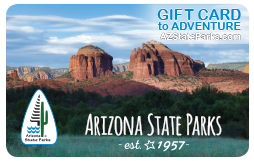 Gift cards purchased at park office locations can be purchased for any denomination, up to $500. Phone orders can be placed Monday - Friday between 8 a.m. - 5 p.m. MST at 877-MYPARKS (877-697-2757). Arizona State Parks thanks the individuals who have proudly served our country. To support our active military members and Veterans, we offer the following day use discounts to our parks. Discounts apply to qualified Veteran discount program pass holder and up to three accompanied adults. 50 percent off day use entrance. Please show your Military ID at the gate, no pass is required. 50 percent off day use Pass to all disabled military. Please bring your VA-Certified proof of service connected disability along with your license. 50 percent off day use Pass. Please bring proof of service (for example a military ID or DD214) along with your Arizona license to a park visitor center. 100 percent free day use pass. Please bring your VA-Certified proof of 100 percent service connected disability along with your Arizona license to a park visitor center to receive your pass. You can pick up your discount program card at any of our parks (partner parks not included) or at our Central Phoenix Office. Thank you for your service!